We can help you make that Special Event even more special with our Studio Parties! Celebrate that Birthday Party or Bridal or Baby Shower, Corporate Function, or Friends Night Out with us. For best results, Schedule your 90-minute event two weeks ahead of time. A $50.00 down payment will hold your spot and ensure enough pieces are on hand to delight your guests. Total cost for all pieces is only $17.00 each. For example, a party with 5 guests would cost $85.00. If you wish, you may decorate the evening before and bring in food and drink. You may choose to clean up your area yourself or have us tidy up for you. A $50.00 cleaning fee will be retained if you'd rather to leave the cleaning to us . Pieces include banks, statues, and cups. All sized appropriately for a 60-minute work time. Photos will be available soon! A blessed time had by all. Please use rear entrance. Right next to the Christian Book Store! Come join the fun as you build your own unique keepsake cross out of a lump of Clay! During this Lenten Season, we offer this time for you to connect with your Creator as you reflect on the life of Jesus Christ- his suffering and sacrifice, his death, burial and resurrection. When Can I Build My Cross? Sunday, March 16th at 2pm. 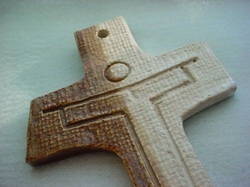 When Can I Glaze My Cross? Sunday, March 30th at 2pm. When Can I Claim My Cross? April 13-18 during Studio Hours! This Gift is Absolutely FREE from Us to You. Praise Be To GOD!